Wood Puzzles supports the education of young children by developing a range of products to assist parents and teachers. 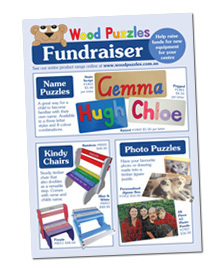 Having a Wood Puzzles Fundraiser for your centre, kindy or school allows parents to purchase from our full range of products with 15% of the basket value of all orders placed credited to the centre, to purchase Wood Puzzles products. Due to the diverse range and personalisation of our products, our fundraiser is operated online though our website. By including all products we hope there will be something for everyone, resulting in more orders and credits for your centre. Being online also means there are no orders or money to be collected.